The Moe the Mouse® Speech and Language Curriculum Box is an innovative early speech and language curriculum box that uses Aboriginal toys and stories to enhance speech and language development in children ages 3 to 5. 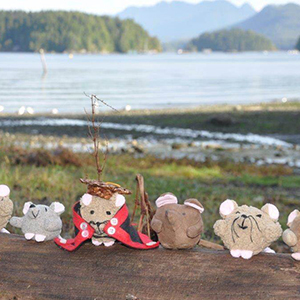 Making the Most of Moe is a workshop developed, owned and facilitated by Anne Gardner and Margaret Chesterman, the Speech-Language Pathologists who developed Moe the Mouse® for BCACCS. This workshop teaches educators and parents how to use the Curriculum Box, and also reviews the basics of speech and language development in young children, strategies for supporting children’s speech and language development, and strategies for supporting children with speech and language delays in childcare, preschool, and home settings. PLEASE NOTE that workshop participants do not receive a Moe the Mouse® Curriculum Box as part of the workshop; participants who decide (before or after taking the workshop) that they want to use Moe the Mouse® in their program must purchase the Curriculum Box from BCACCS. PLEASE ALSO NOTE that BCACCS makes the scheduling arrangements for this workshop, but it is facilitated by outside contractors. We do not deliver this workshop ourselves, and professional fees are charged for the presentation of this workshop.